Teledyne Caris and Teledyne Optech had a combined presence at the 2018 Joint Canadian Hydrographic and National Surveyors Conference during March, offering interested visitors the latest in ocean mapping software and the progress in lidar surveying and mapping solutions. 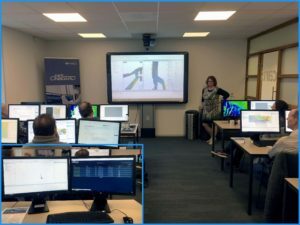 Teledyne Caris also presented a half-day workshop where attendees learnt about the new processing workflow in HIPS and SIPS hydrographic processing suites, capabilities and opportunities which can be leveraged through Bathy DataBase, and advances in automated data processing with Caris Onboard. The companies’ experts also delivered three presenations: “Spatial resolution of bathymetric lidar: point density vs light scattering”, “Bathymetric surfaces to charted features: defining a smooth path to safety”, and “Comparing the automatic boresight calibration against the patch”. Staff were also at hand to discuss the advantages of CZMIL Nova, an advanced airborne lidar bathometer which can measure up to 70 m deep in clear water and penetrate turbid waters. Visitors also learnt about the Optech Titan, a multispectral airborne lidar equipped with a water-penetrating green channel and two infrared channels, to map both land and shallow coastal waters efficiently in the same flight.